The boys look so cute! Haha, Mom has been busted--they're keeping count. :-) I understand burnout. I hope you can find the joy in blogging again. Are you still teaching? we all understand. :) hope all is well with you all! your boys are all so cute! Very cute photo of the boys. I will look forward to your posts whenever you can fit in the time. Take care. Always nice to hear from you.I just got another computer to stay on top of things.I ate too much candy, I would have shocked those boys how much I have consumed. I have trouble keeping my blog current, and I'm not working and don't have children at home. I think you do a great job of juggling everything. I know the feeling of Blog Burn-Out.... I've been through it several times --but 'burn-out' may not be the correct word for me. My problem is TIME... I even have trouble finding time to blog once a week --and seldom have time to answer others' blog posts... Frustrating --because I do love it. I have always been amazed that you have been able to post at all with three boys. And even more so when you started to work. Glad you are back At ALL, so I can chat with you and see what's going on. LOVE Mario and Poe, they are adorable! 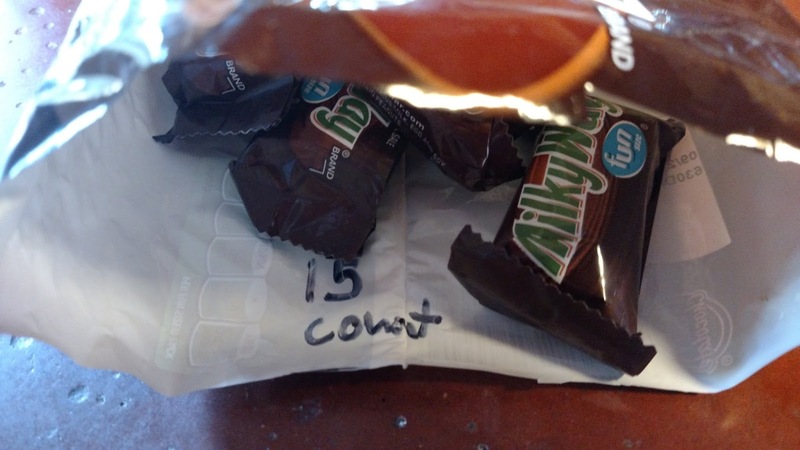 I am assuming you hid most of the candy to dole out gradually, but smart boys will sniff out where the sugar is! I think all regular bloggers need some time out from blogging, and this is their right to do so. I, too, have slowed down a lot with posting blogs, as I, too, have been feeling a little burnt out with writing them. Not to worry, the occasional blog will keep us both in touch with the blogging community! Your boys are getting more handsome by the day! I do love the Poe costume. A favorite writer of mine. They look great! I hope you will show us their other costumes too. 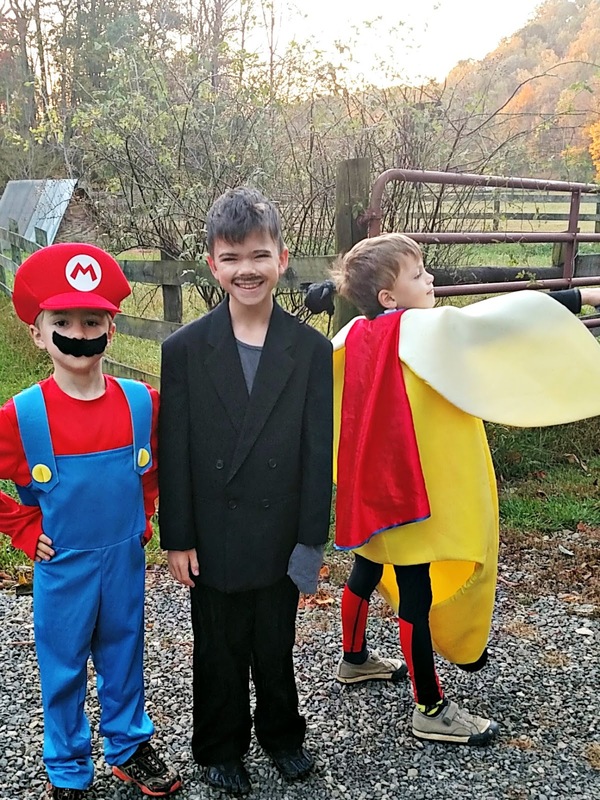 The boys look great, love their costumes! Love the Edgar Allen Poe costume. All bloggers get burnt out at one time or another. Take a rest, then resume when you feel ready. I like the Super Banana! I like that they are all something different. I think once a week is a very reasonable pace--as you can probably tell. There was a time when I posted 3 times a week, and it was WAY too much. You really have to find the pace that fits with your life, eh? Thank you for taking care of yourself . . . sharing when it's right for you is a big blessing . . . you get more of your own life . . we continue to be blown away & inspired by your shares . . .
Lots of people are burning out. Don't do that! Just do what you need to do. I miss having littles that dress up for Halloween. love the costumes indeed! That's why we adore Halloween, right.. I can completely understand your need to reduce your frequency of blogging. Every week I have to prioritize work, teaching, taking care of Little Lewie, cleaning/errands, and blogging. As much as I would like to blog at least one time per week (four times per month), there are times when I simply can't get to it. Many, many years ago, I used to write two or three posts per week, but those days are long gone. I've come to accept that my blogging is more for myself and my few bloggy friends and not to strike it big one day. In the end, I want to look back and remember the joys of motherhood; there are many, and I'm glad I've had the opportunity to document them in this way... Wishing you all the best Lisa. Your accomplishments each week will always continue to amaze me.